Coniston Old Man is a particularly favourite walk of ours. The views, from the Old Man, are fabulous and like many other Coniston Walks, has the opportunity to be shortened and lengthened depending on time, weather and of course stamina! There are so many routes and variations to walk up the Old Man. You can start from the centre of Coniston, itself, by taking the road by the side of the Black Bull Pub up towards and past the Coniston Holly How Youth Hostel. The road eventually becomes unmetalled and you join the river in the deep gully to your left. Cross the first bridge after you meet the fully and follow the path throught the old slate quarry towards Low Water. 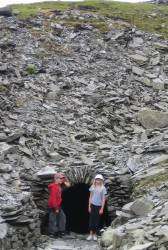 The Old Man of Coniston is a great way to introduce kids to higher level walks. Low Water makes a convenient destination for a break, a great time to see if everyone in the group feels capable for the push to the top. If not then why not walk around Low Water a little, find a quiet spot and an enjoy a picnic lunch, with plans to return to scale the Old Man, at a later date? If weather conditions are perfect then Coniston Old Man walk is one of the Coniston's most popular walks. Therefore can get very busy at weekends and peak holiday periods. If you would rather have the Old Man to yourself then why not plan a sunrise or sunset walk? Alternatively choose an alternative route, such as Dow Crag. Step back in time as you wander past the disused Coniston Coppermines, wondering about the remoteness of the old miners cottages and what life was like during those times. However please be very aware that there are several open mines around, so please do keep a very close eye on smaller children and pets, and stay on marked paths during low visibility weather. We have compiled a selection of cottages in Coniston and the surrounding hamlets, that we think you will love. Each has something special to offer you. Maybe a stunning location, or Lake Access. Some are traditionally built Cumbrian properties allowing you to get away from it all and relax in this unspoilt corner of Cumbria. Have a browse and see which cottage is perfect for you. Routes offered for ideas only. Please consult an Ordnance Survey Map for any walks in Cumbria. Be sure to let someone know where you are going and when you intend to be back. Be safe and enjoy Cumbria. Discover Cumbria privacy policies and disclaimer policy. Cottages advertised on this site : Please ensure that you check all details directly with the cottage lease company prior to booking.